Courier post mailer barcodes generator software is fully featured with barcode generating facilities to design highly effective barcode labels for various applications of post office and banks in less time. Barcode maker application for post office and banks provides perfect solution to design customized barcode labels to fulfill all labeling requirements of postal and banking industries. Courier and postal barcode maker software supports all globally used 2D and linear barcode font symbologies to design barcode labels, coupons and stickers according to banking and post office service requirements. Courier post mailer barcodes creator tool provides different adjustable barcode settings such as color setting, image setting and font setting to design eye-catching barcode labels. 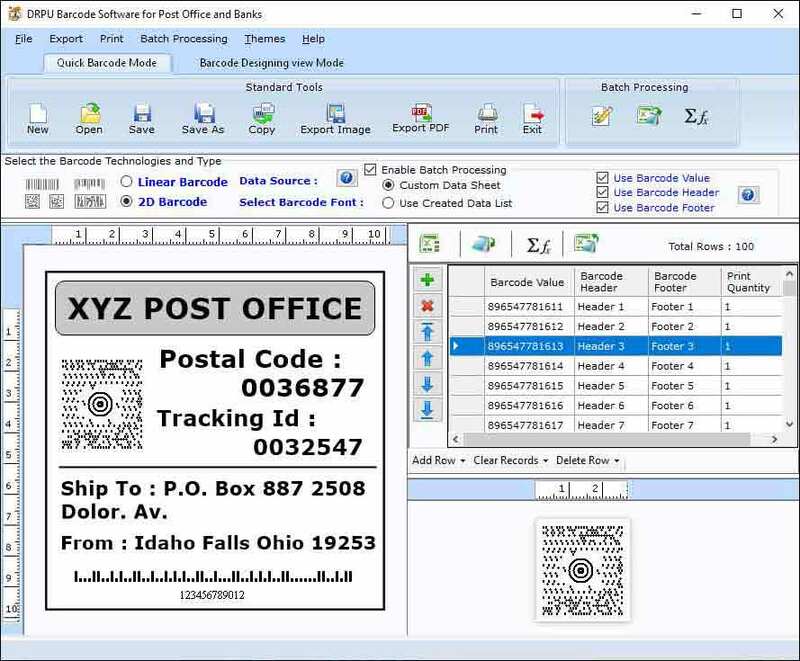 Barcode generator utility enables users to save created postal and bank barcode labels in their PC in graphic formats for future modification and insert in any windows application according to their needs. Postal and bank Barcode generator utility provides flexible way to easily manage all banking and postal services and keep track of their processes. With the help of post office and bank barcode software user can generate barcode labels in various shapes and sizes like rectangle, ellipse and triangle. Barcode maker program provides several types of designing objects such as images, line, texts, pencil and pictures to design barcode labels in user required formats. Software Features: * Provides best way to easily design customized barcode labels for different banking and postal applications. * Supports excellent print settings and print preview function to print high resolution barcode labels and reduce printing errors. * Excellent ability to manage and track all banking and post office processes to improve their professional efficiency. * Cost-effective and highly reliable barcode maker software used in various post office and banking sectors.